Monkfish tail refers to the portion of fish left once the head has been removed. Fishermen or fishmongers will often remove the ferocious looking head prior to the fish being sold so almost all of the monkfish available to buy is the tail. A monkfish tail has one central bone running down the centre which divides the 2 monkfish fillets. The top side of a monkfish tail will be covered in a dark skin which needs to be removed before cooking. On the underside, the skin is white but this is often removed before the fish is sold. A whole tail will weigh around 600–800g – more than enough for 3–4 people. As with most fish, it is best to buy monkfish tails as fresh as possible. Monkfish tails can be cooked whole or cut into steaks across the bone. 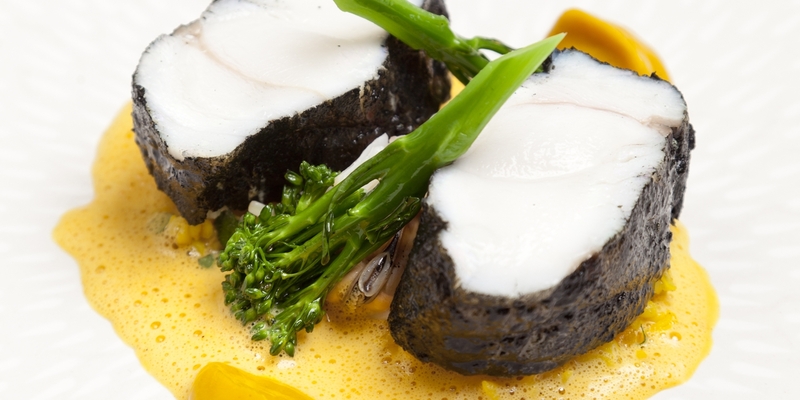 The presence of the bone in a monkfish tail will help impart flavour and keep the fish intact as it cooks. The monkfish needs to be correctly prepared before cooking; remove the skin and sinews and trim the tail and fins. Due to their size, monkfish tails tend to be roasted – they make a grand centrepiece to a large celebratory dinner. Nathan Outlaw removes the tail and stuffs the cavity with sage, cranberry and pine nut in his sumptuous stuffed monkfish recipe. Otherwise, tails can be separated into fillets and pan-fried, poached or battered and deep-fried. Excluding the main central bone, monkfish tails have no other small bones within the flesh. If the bone is removed, use it to flavour home-made fish stocks. As monkfish has robust flesh and a subtle taste, it can stand up to relatively strong flavours such as Parma ham and red wine (Chris Horridge's recipe for Monkfish wrapped in Parma ham, with red wine jus, lemon sabayon and cockles), black curry powder (Marcus Eaves' Monkfish tail with blackened spices, cracked wheat and lightly spiced mussels) or chorizo (Marcus Wareing's Monkfish with chorizo crust and spiced beans).